It’s the final instalment of this year’s Outdoor Extravaganza, and I can’t believe how much progress everyone has made over the past few weeks! Sometimes all it takes is a little accountability to finally get to those projects you’ve been putting off, wouldn’t you agree? 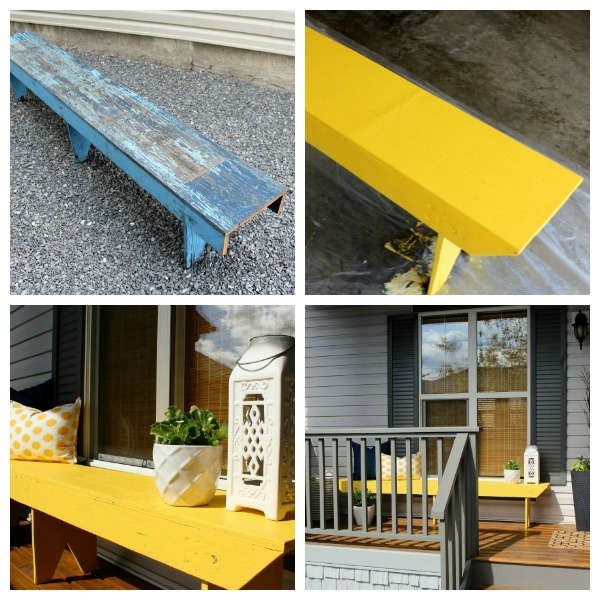 Yesterday I shared my yellow bench makeover with you. To date, it’s probably the boldest colour I’ve used in this house. I adore the fun personality it brings to our front porch, and it makes me smile every time I pull up on the driveway. Outdoor paint projects can definitely be challenging with the weather, and I was just able to sneak this one in. It always amazes how easy and inexpensive painting can be, yet it still has huge impact. Be sure to check out all the fabulous paint project posts by the rest of the party hosts, Dawn, Tiffany, Carmel, and Barbara, before linking up yours below. I’ll be sharing my top Paint project picks over the next week on Facebook and Twitter, so watch for yours! Also, be sure to come back next week to see if I feature your project from any of the 3 weeks in a blog post. Thanks for hosting your outdoor painting linky party Shauna and I’m looking forward to reading the posts here! Wow! That looks so good. What a great punch of color that yellow makes! So pretty. That yellow ikat fabric is my most favorite ikat fabric! Shauna, thanks for hosting your Outdoor Painting party! Your lovely Yellow bench makes me smile! Makes me think … and feel Summertime! I love the bright yellow!! My project is yellow too:) Thanks so much for hosting.